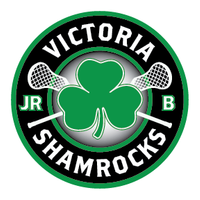 The Langley Thunder came into the Q Centre but the Jr. ‘A’ Shamrocks came away with a 10-8 victory to move ahead of them into fourth place in the league standings. The Rocks led3-1 and 6-3 by period but Langley battled back to get within a goal late in the game before Braylon Lumb put the game out of reach with an empty-netter wit hjust 2 ticks left on the clock. That was Lumb’s fifth tally of the game as he continues his league-leading pace. Starting goaltenders were Torin VanRheenan for the visitors and Cam Dunkerley for the home team. It was Victoria taking an early lead, Max Wilson scoring unassisted at 4:14 on a run. Langley replied with a power play goal at 8:03, Nathaniel Kozevnikoff finding the back of the net from just outside the dotted line. The Thunder took the lead at 9:56 with a goal from Tesi Oakes on a shot that Dunkerley got a piece of. Special teams took over for the Rocks as Brayden Brown scored a power play marker at 14:01 with a hard shot from outside the dotted line and Brad McCulley restored Victoria’s lead with a shorthanded goal at 18:40 with a quick stick in close. Shots on goal were pretty even with Victoria holding a slight 15-14 lead. The second period saw the Shamrocks get on a 4-goal run, beginning with Lumb’s first of the night just 29 seconds in from the side of the crease. Jackson Boyd made it 5-3 Rocks at 1:17 going to the net and added his second of the game at 6:59 with a hard shot from outside the dotted line. At 8:18 Lumb collected his second from right in front, putting the ball behind the goaltender to make it 8-2. Langley did manage to respond with a pair, Ty Ewen tallying at 10:32 from well out and Ryan Martel adding a shorthanded goal at 14:25 getting in close. Shots on goal were still in Victoria’s favour by a19-16 margin, 34-30 overall. It was Langley getting the quick start in period 3, Martell picking up his 2ndof the game at 5:20 from outside the dotted line. Victoria replied with Lumb’s hat trick goa lat 10:55 from just inside the dotted line but Langley crept back into the game with a pair of goals from Nathan McKeigan and Dylan McIntosh at 15:02 and16:51. Suddenly the lead was cut to just a single goal. Enter Lumb with his 4thof the game at the 18-minute mark with an overhand shot from the dotted line. The teams traded goals before time ran out, McIntosh picking up his second for Langley and Lumb firing his fifth of the contest into an empty net at 19:58. 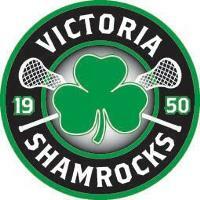 Braylon Lumb scored 5 times for the Shamrocks while Jackson Boyd added 2 goals and 3 assists. Other goals came from Brad McCulley, Brayden Brown and Max Wilson. Marshal King added 3 helpers in his first action of the season. 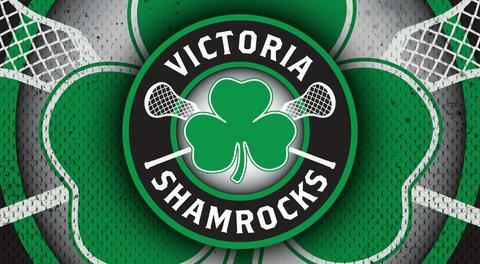 The Shamrocks are on the road Sunday to face the Burnaby Lakers and Tuesday, June 12 in Nanaimo for a match-up against the Timbermen at the Nanaimo Ice Centre at 7:30pm. They return to the Q Centre next Saturday, June 16 to take on the New Westminster Salmonbellies at 4:00 pm.